Come Mix it up with us! On Sunday 28th April, Off Course Promotions will be sponsoring the day and it promises to be a humdinger! We will also be having an auction afterwards for a lovely 5-night stay for 8 people at Pinnacle Point, you need to be here to bid for it. Booking can be done at the Pro Shop and online booking from the 18th April. Our annual White Squirrel was a huge success with 136 players in the field on a magnificent course with fantastic weather. A huge thanks to our sponsors Philwest Volkswagen Somerset West for making this day so special. Baie dankie Alan Davison, Neil van Zyl and team, it truly is nice to have sponsors like you on board. Marcia Crous, Bianca Wernich and Claudia Nel is our Club Champions! Well done ladies! This year’s white squirrel is going to be a humdinger! We have four spots left, so don’t miss out on this one. We have some fantastic prizes! Read more in our latest newsletter: http://bit.ly/2FFvveO Marcia Crous, Bianca Wernich and Claudia Nel is our Club Champions! Well done ladies! Ladies and gents, we have a few days left before Club Champs start thanks to all that have entered, but we need some more to enter. Currently we have 80 players that have entered, and we need at least 20 more. Our C-Division guys are looking a bit thin - remember the C-Division is playing off the blue markers making it a lovely challenge. Come on members, let’s make this a great championship! Read more in our latest newsletter: http://bit.ly/2XFDdNb Ladies and gents, we have a few days left before Club Champs start thanks to all that have entered, but we need some more to enter. On Friday 1st March we will have our Awards Evening to recognise our members that have achieved and performed during the year of 2018. More information is available in this week's newsletter: http://bit.ly/2BB5St0 On Friday 1st March we will have our Awards Evening to recognise our members that have achieved and performed during the year of 2018. Our International Day for 2018 was a huge success! A big thanks to Kevin vd Spuy for organising this fantastic day. I think the pictures say it all...Congrats to our best dressed couple Jane & Derrick Wagenfeld! Happy New Year to everyone! May 2019 be a year of excellent health, great friendship, lots of love & smiles and prosperity. May our members grow as they did last year and may our new course (baby) grow into a beautiful teenager with no pimples. Most important, may our GEES continue and our family become even stronger. On Sunday we had a very successful mixed, sponsored by Doc and Jane Wagenfeld. We were 116 players on the field, which is awesome, and we all enjoyed the little 45 km breeze. 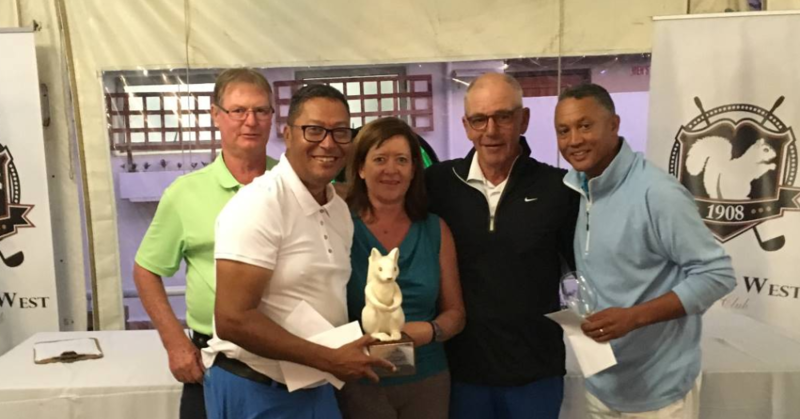 Read our newsletter here: http://bit.ly/2Bub1nh On Sunday we had a very successful mixed, sponsored by Doc and Jane Wagenfeld. We were 116 players on the field, which is awesome, and we all enjoyed the little 45 km breeze. Our Classic Week will go down in history! All credit must go to the ladies section that created this magnificent Mexican atmosphere in the clubhouse and for organising the Mixed and Spring Classic. Thanks to Kevin vd Spuy for entertaining us yet again at the Friendship Cup, it really was a great team builder! Read our newsletter here: http://bit.ly/2QuuGbQ What a wonderful week we had! The Squirrels take down the Eagles! Last 2 Par 3 comps left for the year. Sign up now. The par 3 competition is nearing its end for the year, we only have 2 games left scheduled for the 5th & 12th October. This competition has been a huge success, thanks to all that supported it and a massive thanks to Willie & Jay from Ben’s on the Beach that were instrumental in creating the wonderful fun atmosphere every second Friday. You guys really kept the GEES in the Club! It’s amazing to see 9 x 6 balls playing all kind of different competitions and having serious fun. Read more by following this link: bit.ly/2DJIJYS The par 3 competition is nearing its end for the year, we only have 2 games left scheduled for the 5th & 12th October. Next Monday, 24 September is our Annual Braai Day, or Heritage Day as they call it. It is a public holiday and the weather is looking great, so no excuse! The competition will be a Betterball Stableford and we will have a 9 hole and 18 hole competition, you decide. For those that have not played or do not have a handicap, men play off 18 and ladies off 24. To join us for the braai after golf, all you have to show is your braai ticket and Louis will make your 250g steak, a delicious piece of wors, ciabatta bread complimented with some green and potato salad. 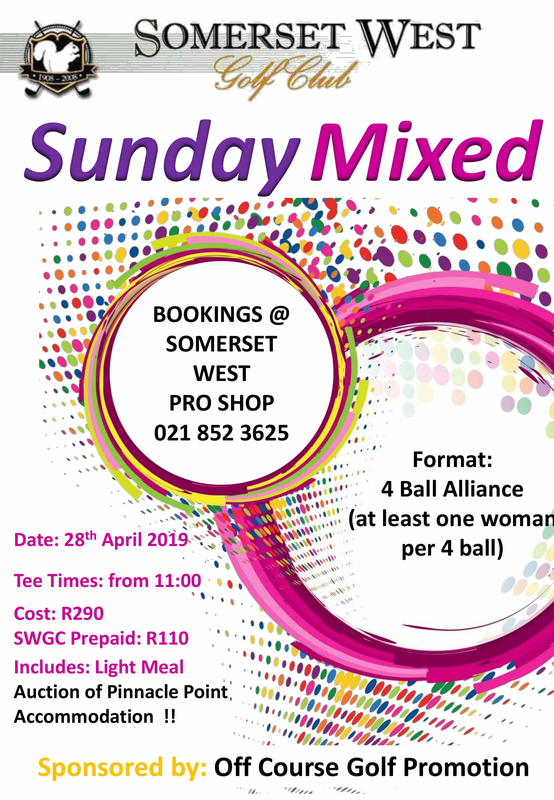 Tee off times are from 12h00 – 13h00 off both tees. You can book online or phone the Pro Shop. Come and join us! Dit gaan baie lekker wees! Next Monday, 24 September is our Annual Braai Day, or Heritage Day as they call it. It is a public holiday and the weather is looking great, so no excuse!